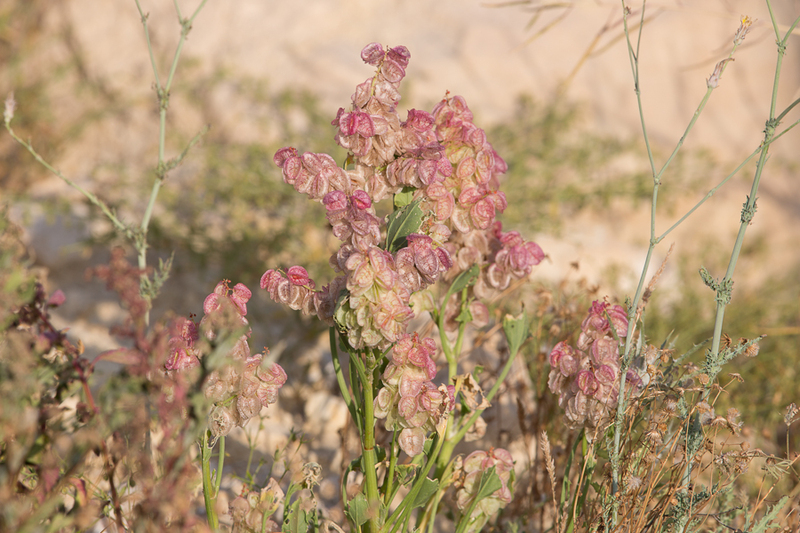 The Bladderdock Rumex vesicarius is an abundant annual found on rocky land and shallow sand. It is most noticeable when fruiting, when it bears large, long clusters of papery winged fruits that are often pink, red or pale straw in colour. Sandwiched between the wings is the seed. The leaves are glabrous and slightly succulent. They are the favorite food of the Striped Hawkmoth caterpillar, which in a rainy year, can be seen feeding on these plants in large numbers. Its height is up to 35 centimetres and it has been used in traditional medicine to cure stomach complaints and toothache.